They may smell like dirt, rotting wood or old cheese but white truffles are one of the most sought after culinary delights in the world. Would you like to team up with a dog or even a truffle-hunting pig for the satisfaction of unearthing your own ‘white diamond’? The intricate white veining and marbling throughout the truffle creates an aroma and flavour that is gastronomically unique, wonderfully intoxicating and highly prized. Often considered the finest examples in the world, truffles from Alba in Italy regularly sell for $14,000 per kilo, but any aficionado will tell you they are worth every penny. Discover how white truffles get from deep underground in a misty Italian forest to the plates of the world’s best restaurants. It begins in Alba, Italy with dogs or pigs sniffing out the ‘white gold’ in the dawn light with an experienced guide. Then there’s the festival itself, where truffle middle-men- the local merchants - set the price for each year and sell the raw ingredient onto traders. The largest and most prized truffles and held back for the prestigious invite-only truffle auction Castello di Grinzane Cavour. Top chefs from Los Angeles to Hong Kong frantically bid against each other via satellite links to ensure their restaurants get the largest and most delicious truffles available. 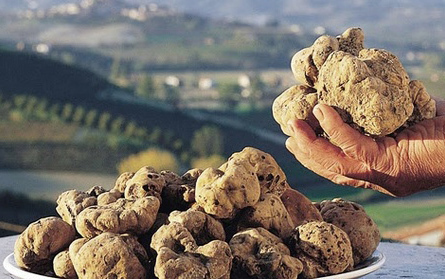 However don’t be fooled into thinking that Italy is the only place to hunt for truffles. France is also a hotspot for the elusive fungi. In fact, if you ask anyone in France they will assure you that the Perigord or French black truffle is in fact the best in the world despite the fact that auction prices say otherwise. A Macau billionaire paid $330,000 at a charity auction in 2010 for nearly 1.3 kilograms of Italian white truffles, proving just how valuable these tubers can become. In America there is also a vibrant truffle scene with varieties grown across the land from Tennessee to Texas and all the way up to Oregon in the northwest. Complete with its own Truffle Festival, Oregon is fast becoming the best place in the world to get a truffle bargain, if such a thing exists. Its white truffles have a garlicky-cabbage aroma similar to the Alba white truffle but what they lack in intensity they make up for in aroma complexity. Over the years Oregon truffles have been pitted against the prized Old World varieties in a number of unscientific blind tests and have often come out on top. This does not mean that the Oregon white truffle is necessarily better. But the European variety still costs at least $3,500 per kilogram, whereas the Oregon white truffle is around $200 per kilogram. If you’d like to unearth some buried gems of your very own, contact us and we’ll pick perfect place for you to start looking.